Children learn in many ways and learning is a continuous process which continues throughout all our lives. Therefore, repeating and the development of skills throughout a swimmer’s life is vital for learning. For example, log rolls and pendulum rotations become forwards and backwards rolls and then tumble turns for a competitive swimmer and running on the spot (in water) becomes treading water with breaststroke legs, a vital personal survival skill and water polo skill. As a swimming teacher, it is important we communicate in several ways with our pupils as there are many types of learners. We use verbal instructions, visual aids such as demonstrations and physical (learning through movement) combined with games and problem solving tasks. It is important to help children grasp the important concepts and principles that will aid their swimming development. The best way to do this is through watching and doing! Visual and tactile! And of course, plenty of enjoyment! Correct demonstrations will ensure children can observe what the stroke should look like and they can then imitate their teacher and experience the skill or movement for themselves. 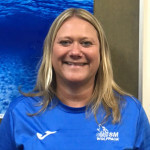 Swimming teachers also help children experience the correct practices by being hands on, correcting and giving appropriate feedback whilst the children are swimming. Children are also known to learn better through play especially in the early years and structured games will help increase children’s confidence in the water and encourage active learning. Children develop in many ways through playing; they increase their social and cognitive skills and their self-confidence as well as relaxing and increasing motor skills, coordination, space awareness and creativity, imagination and problem solving. A swimming teacher’s interaction whilst playing helps extend learning. You will observe in your child’s swimming lesson that teachers interact with the group, asking questions and posing challenges for the children. They use fun creative ideas such as swim like a mermaid, look underwater at the fish or set treasure hunts and they develop motor skills such as blowing, pushing and pulling within the lessons. Look out for some of the following games when watching your child’s lesson that will help to develop their movement, underwater confidence, buoyancy, gliding, coordination and speed using games and play. Problem solving – e.g. hold hands in a 3 – how can you end up facing the outside without letting go? How can you push and glide further? These games can also be practiced during family swim time. Why not give some of them a go when you next swim with your child? !